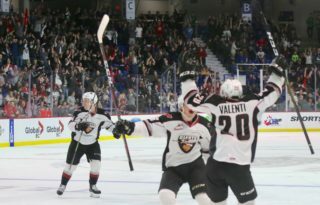 A best-of-seven series between the Vancouver Giants and the Seattle Thunderbirds has now become a best-of-three following a dramatic come-from-behind victory by the Thunderbirds in Game 4. Wednesday night at the ShoWare Center the Vancouver Giants dropped a 4-3 score to the Seattle Thunderbirds. By the 2:19 mark of the second period, the Giants held a 3-0 lead only to have Seattle score four unanswered goals of their own to even the series. Davis Koch, Dylan Plouffe and Brayden Watts had goals for the Giants as the series now shifts back to the LEC for Game 5 on Friday night. VAN – 10:33 into the first period the Giants got on the board when Dylan Plouffe’s (3) shot from the left-wing point deflected off a Thunderbird stick and by Seattle starter Roddy Ross. Davis Koch and Lukas Svejkovsky earned assists. 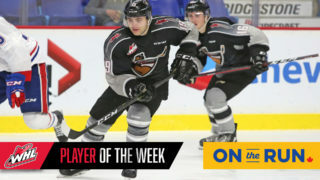 VAN – Then with three minutes remaining in the first, Brayden Watts extended Vancouver’s lead to 2-0 when he took a drop pass from Jared Dmytriw, skated into the left-wing circle and roofed his second goal in as many games. Seth Bafaro added the second assist. VAN – Davis Koch extended Vancouver’s lead to 3-0 when he potted his first of the series off a two-on-one rush with Tristen Nielsen. The second assist on the play was credited to Alex Kannok Leipert. SEA – The Seattle Thunderbirds comeback started at 5:18 when Kelti Jeri-Leon potted his first goal of the series on Seattle power play. From behind the net, Jeri-Leon grabbed a pass from Nolan Volcan, skated around the net and snapped a shot by David Tendeck. 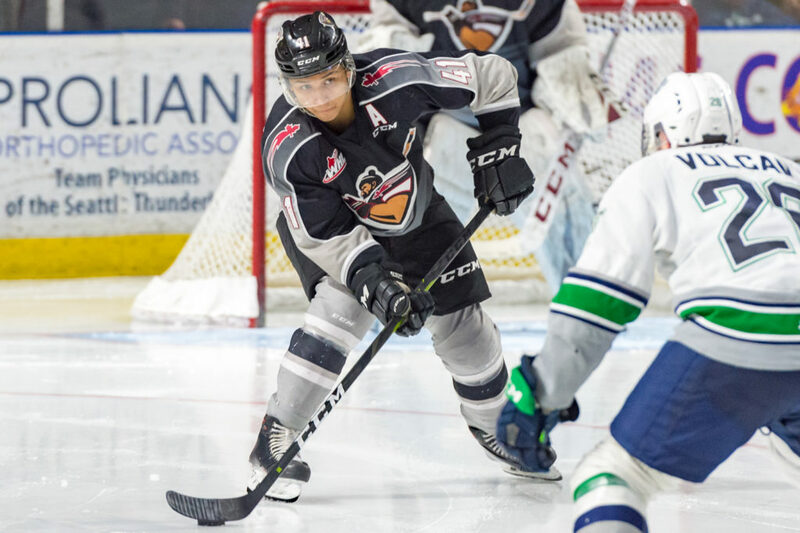 SEA – 20-year-old Noah Philp (1) potted his first goal of the series at the 7:11 mark of the third period to move the T-Birds back within a goal. Andrej Kukuca and Jarret Tyzska assisted. SEA – Then at 11:13 on a power play, Andrej Kukuca blasted home his third of the series from the left-wing circle. Noah Philp and Matthew Wedman each assisted on the game-tying goal. SEA – At 15:46 the T-Birds completed their comeback bid when Matthew Wedman skated into the slot, took a feed from Henrik Rybinski and buried his second of the series, giving Seattle the 4-3 lead that they would not relinquish. Next Game: Friday night at the LEC at 7:30 PM. 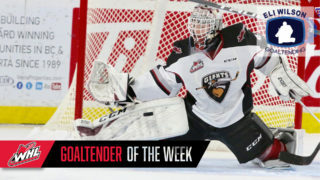 Giants forward Davis Koch leads all WHL players with seven points (1G, 6A) so fari n the playoffs. 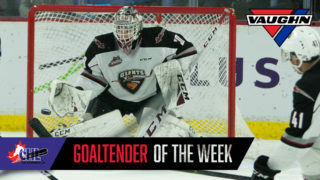 Brayden Watts has now scored in back-to-back games for the Vancouver Giants. 4:16 into the game, Thunderbirds forward Sean Richards was ejected from the game after receiving a five-minute major penalty for checking-from-behind. Aidan Barfoot was on the receiving end of the hit. He left the game and did not return. Richards’ hit will be reviewed by the Western Hockey League and he could face suspension. The T-Birds were also missing defenceman Cade McNelly who was serving the first game of a two-game suspension for Supplemental Discipline. Jake Lee returned to the Seattle lineup after serving a two-game suspension for cross-checking Justin Sourdif into the Seattle net in the final seconds of Game 1. Wednesday night marked the first time in four games that the Giants had been outshot by Seattle.